Over the next two weeks, we will be sharing the Derryfield Academic Vision through three evening presentations for parents and families. We invite you to join us to share your thoughts and questions as we provide an overview of our faculty’s exciting commitment to redesign the student experience for the 21st century. 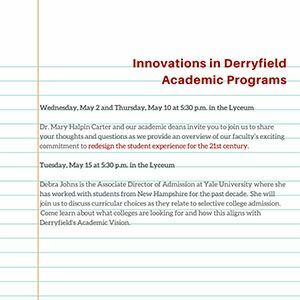 Join Dr. Mary Halpin Carter and our academic deans, Lindley Shutz and Brent Powell, to learn more about Derryfield’s academic program vision. The talk will be followed by a Q&A session and survey. Debra Johns is the Associate Director of Admission at Yale University where she has worked with students from New Hampshire for the past decade. She will join us to discuss curricular choices as they relate to selective college admission. Come learn about what colleges are looking for and how this aligns with Derryfield's Academic Vision. What follows is an excerpt from Dr. Carter’s introduction to our presentation. You can download notes on the Academic Vision here. Please join us for one of the evenings and/or contact us, the Deans of Academic Program. We can’t wait to share with you the complex and rich ideas and experiences that shape each of the recommendations. “Derryfield faculty and staff know that best practice in learning looks different in the twenty-first century than the twentieth. The ability to watch a brain learn and the resulting neuroscience has changed the way that we understand memory, skill development, and creativity. It has pointed the way to teaching in a way that calls upon students to apply knowledge as they acquire knowledge, to do more relevant research, analysis, and problem-solving than when we were in school. The faculty has thought a lot about Derryfield graduates in the 21st century . . . What must they be able to do? How must they be able to think? In an era of globalization, automation, and artificial intelligence, our children need to become the colleagues who look to make systems, products, and practices ever better and have the ability to effectively lead teams and organizations. They need to be people of initiative who iterate- these are valuable to every company and organization--and people with ethical clarity who can lead teams and groups. We look forward to your feedback, which is so important, as we develop this exciting new program. We are eager to learn what you are most excited about, what you would like to see us do first, and if you think there are components not worth pursuing.